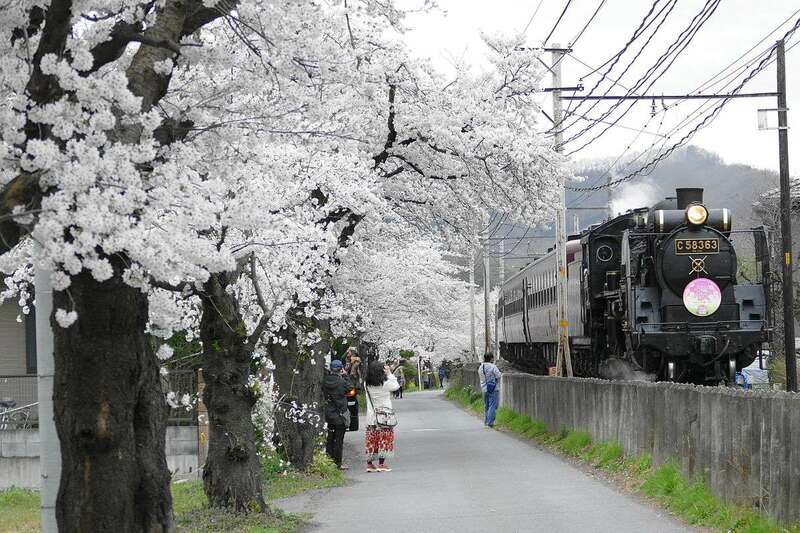 Featured photo of Steam Locomotive with Cherry blossoms by アラツク is used with permission. The Steam Locomotive (SL) Paleo Express that runs between Kumagaya and Chichibu is the closest steam locomotive ride to Tokyo. Thanks to the Shinkansen from Tokyo and Ueno stations, it takes less than 40 minutes to get to the Kumagaya station. Shortly after you set off from Kumagaya you are in enveloped in stunning rural scenery. With the hypnotic chug of a steam train on tracks, the feel of the raw power of the engine, the unparalleled scent of SL smoke and the distinctive sound of a SL whistle you will surely never forget this rare opportunity to experience a train journey from bygone years. On our recent camping trip to Chichibu to see the Moss Phlox, the plan had been that I would take the four kids on the SL from Kumagaya to Nagatoro. The train goes all the way to Mitsumine Station, but Nagatoro is the nearest station to Nagatoro Autocamp where we were glamping. My husband was going to drive to Nagatoro station with the camping goods, after dropping us at Kumagaya. In theory we would have arrived at roughly the same time; the train might be slightly quicker. Things didn’t quite go as planned. We were too late leaving the house to catch the very punctual SL in Kumagaya. Once again, a long awaited ride on a SL has evaded me. I have wanted to ride this particular SL since I first saw it in Nagatoro in 2006. It will happen someday! I want to share the information I collated about the SL ride in the hope it is of interest to others. Special events are scheduled for May 27th, July 22nd and 23rd, and October 21st and 22nd. The SL will stop running for 2017 on December 10th. Another place you can take a Steam Locomotive ride in the Kanto area is in Annaka in Gunma. The SL stops beside Usui Touge Tetsudo Bunka Mura aka Poppo Town. This looks brilliant! Ill be in japan for 6 days in june. I really want to take this train! Im worried now ill totally forget as im travelling everywhere and elsewhere before then! I shall try to remind you 🙂 When in June? I am looking forward to reading about your newest adventures here. How long has it been?